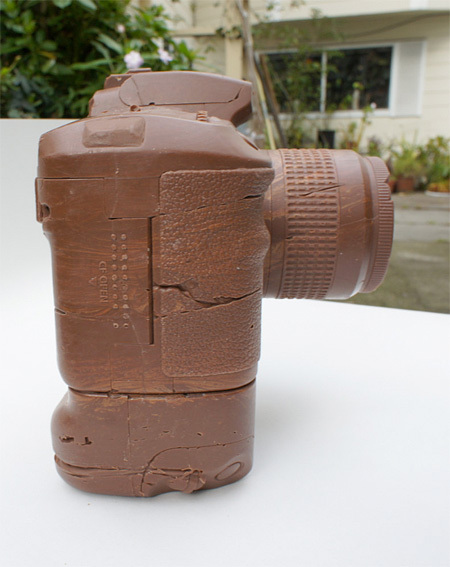 San Francisco based artist Hans Chung created detailed replica of a Canon DSLR camera out of delicious chocolate. 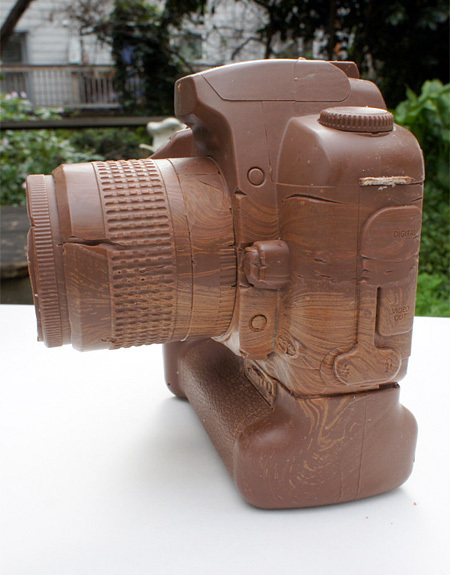 Edible Canon DSLR weights 5 pounds and comes equipped with chocolate battery grip and a camera lens that was also made from chocolate. 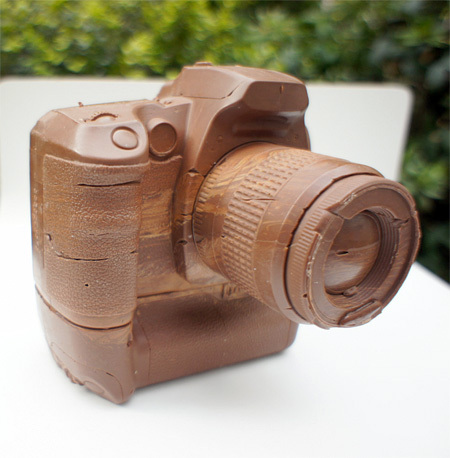 Limited edition “Chocolate Camera” can be yours for only $500. It is really nice it looks yummy too it made want to eat chocolate. $500 chocolate?! I love it, but I think I’d rather buy the real camera. So he made a mould n poured chocolate… What’s the big deal? Nice camera! How are the pictures?!! LOL!!!! Agree with Xcallibur, and it’s not even done that well. Yah, not well done for that kind of price. This could have been SO much better. for sure more than a mould needed!!!!!!!!!!!!!! Wow this… Isn’t impressive at all really? You can see that the chocolate wasn’t tempered properly as it’s all dull and smudged. The cracks and imperfections don’t help the cause either. It looks like he made a nice mould, but didn’t know how to use it. 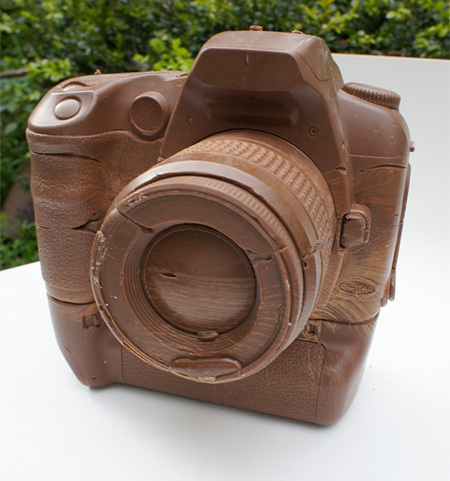 It would have been much better had he made the mould and asked a professional chocolatier to make the camera from quality, tempered dark chocolate, that would definitely justify the price tag. Ouch… cool idea, poorly executed, horribly overpriced. Mini ones would be cool for favors or something. Some of you have been balking at the price. Let met explain the process. I buy a real camera and a real lens. Then I make a mold box and make a mold. The camera is pretty much destroyed in the process. Making a mold of something so intricate is not easy nor cheap. The mold material required to achieve this level of detail does not last beyond 10 copies. After 10 copies, some details start to fade away. Each camera takes about 5 hours of elapsed time of tempering and pouring. I only have a small chocolate tempering machine. I believe there are 5 photo geeks in this world that have a loved one that knows they would appreciate this. I would only pay $30 for this. Not impressive, not special at all..I didn’t like it. Sorry. If you’re going to destroy the camera in the process anyway, couldn’t you get a better material to do the cast in? Or make a positive cast in urethane or something so you don’t need to keep ruining cameras due to the crappy molding process? This guy seems full of BS. Hi, I’m Hans, the guy that made this. If you think you can do better, then please do. Lets elevate this and show the world what can be done. Maki, I have reached out to chocolatiers to help me with tempering, but they have not been responsive. I’ve even been introduced to them by food brokers that rep premium brands. Please shoot me any intros you can make. Joe, I’m new to all this. Thanks for the pointer to urethane. I really appreciate it. My main criteria originally was materials that were explicitly stated as food-safe. I will look into urethane. No problem. I come from a family of sculptors and artists and worked in my uncle’s special effects studio for a short time as a shop hand. I’m no expert, but it is always a good idea to make a positive cast in case something goes wrong with the mold or as you may only get one opportunity to do a cast (of an actor, loan prop, etc.). Apologies for the attack on your character. Tell you what, you other guys who only give bad comments and feedback are just plain dull people. Yeah sure he didn’t do a good job of it but it doesn’t mean you can rain crap all over him. Stop complaining and being annoying children. He did a good job for a first try and considering that he didn’t get help from any prof worker, I’ll like to see you do better. just an idea : couldn’t you ask for a dummy/display camera/lens ? or at least get a used/broken ones, so the cost will be cheaper ? How cool! I wouldn’t know whether to eat it or frame it! 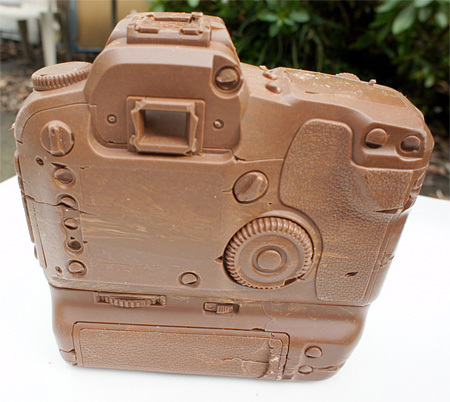 Are the chocolate battery and the chocolate film still inside the chocolate camera? Where are the chocolate pictures?